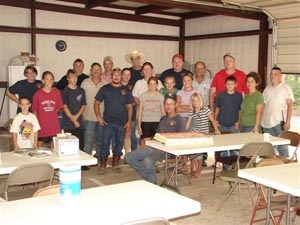 Volunteer Fire Departments (VFDs) are an integral part of our rural communities. They have many challenges such as funding, training, recruitment and retention. A first rate VFD can have a significant impact on not only emergency services and quality fire protection but also fire insurance savings. The Insurance Service Office (ISO) gives Public Protection Classifications (PPC) ratings to every community in the state. Just going from a 10 (highest) to an eight can any times save a homeowner $400 or more a year. To address the needs of our VFDs we have conducted ISO raining, printed emergency response manuals and started a Recruitment & Retention project. 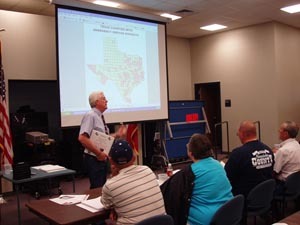 In the 40 county areas of the Post Oak, Pineywoods, Sam Houston and Southeast Texas RC&Ds we have printed over 175 of the Emergency Response Manuals for 11 counties. These manuals assess the individual VFDs and make recommendations for improving their PPC ratings. Jimmy Woodard with the Office of Rural Community Affairs ORCA) has now begun to administer this program. We are excited to continue working with Jimmy. 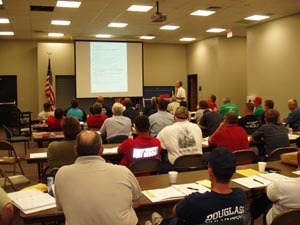 Our third ISO workshop was on May 19 in Nacogdoches. Thirtyone volunteer firefighters attended representing 19 VFDs from eight counties. Charles Gangluff, Program Manager for the Arkansas Rural Fire Protection program, Jimmy Woodard, ESD Coordinator ORCA, Phillip Bradley, Assistant Manager, Insurance Service Office, Will Collier, State Firemen's and Fire Marshal's Association of Texas, Kelly Scout, Texas Forest Service, Jesse Williams, Texas Department of Insurance and Bryan Loudenslager, RC&D S.A.F.E.R. Recruitment and Retention Coordinator were speakers. Pineywoods, Post Oak, Sam Houston and Southeast Texas RC&Ds received a $132,000 grant from Homeland Security to do a Recruitment and Retention project over three years. This will include a survey to compile statistics in our 40 counties to assess needs and successes. We will also have training workshops on recruitment and retention and produce a Volunteer Fire Department Procedure Manual for each VFD. Homeowners in East Texas could eventually see a drop in their fire insurance rates as a result of Meadows Foundation grants awarded to four East Texas Resource Conservation and Development Councils. According to Ken Awtrey, Pineywoods RC&D coordinator, the plan is to use the funds to assist area volunteer fire departments in training and planning to improve their fire protection coverage, thus lowering neighboring homeowners insurance costs. "We've modeled our program after a successful project in Arkansas, where it resulted in lower (Insurance Service Officer) ratings," Awtrey said. The Pineywoods RC&D, which encompasses 10 East Texas counties, along with Post Oak, Sam Houston and Southeast Texas RC&Ds, applied for the funds and were granted $33,000 per year for three years by The Meadows Foundation to fund their own version of Arkansas' project. The funds will become available in June. Awtrey said the goal is to hire a part-time person to evaluate VFDs that wish to be involved in the project and create master plans that identifies areas where fire protection may be improved, thus earning a lower ISO rating. The lower the ISO rating, the lower the personal property classification (PPC), which determines insurance premiums for homeowners. He pointed out that an area that is currently rated a 10 on the PPC scale, can save approximately 20 percent on their premiums if the fire coverage area drops two points to an eight on the PPC scale. "Some of the recommendations can be as simple as a little bit of training and maybe putting in some dry hydrants," Awtrey said. 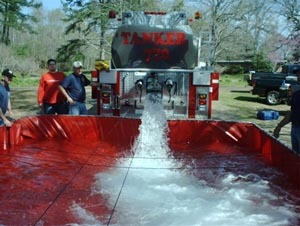 Dry hydrants are placed near ponds where a fire department can siphon water from to transport water to a scene. Another of the program's objectives is to help volunteer firemen to be trained in responding to natural disasters and threats to homeland security. Also included under the training umbrella is teaching departments how to write effective grant applications, which will bring in more funds to better serve the public. Awtrey said the initiative in Arkansas began in 1996, and at least $37 million per year in insurance savings can be attributed to the program. The new project established in Texas will be available for VFDs in the four East Texas RC&D areas totaling 40 counties. The Meadows Foundation is a philanthropic institution, whose mission is to "assist the people and institutions of Texas improve the quality and circumstances of life" including programs that "employ imaginative, innovative ways to solve community problems." Awtrey said he is excited about the project, and hopes that if it's successful, the state will adopt it and fund it statewide. This article was written by Michael Rodden of The Daily Sentinel. Used by permission.